Binge watchers are seriously dedicated to their shows, and if you want to surprise and delight them, perhaps the best way to do it is through the things they love. LG Electronics is launching a new social media campaign to do exactly that, teaming with Netflix to bring the characters of the latter’s programming to some of its shows biggest fans. The “Serious Watchers” campaign is designed to move the brand beyond “techs and specs” to forge a deeper connection, says Michelle Fernandez, head of home entertainment marketing for LG Electronics USA. The effort, from FCB New York, provides loyal fans of Netflix shows with a once-in-lifetime experience as a reward for their dedication. Targeting such serious watchers is another way to forge a connection with those who are truly dedicated to their televisions, Fernandez says. “It’s these consumers who best appreciate having the best experience out there,” she says. 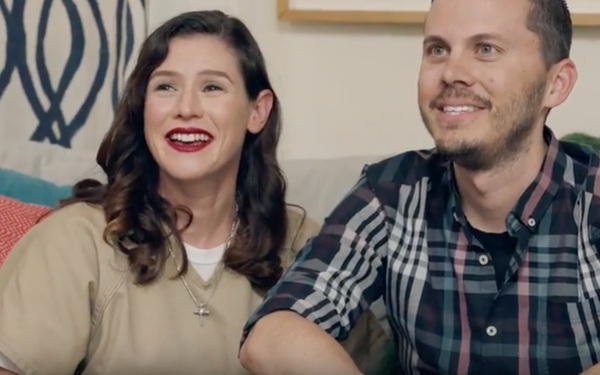 The first video in the series features actress Yael Stone in character as Lorna Morello from “Orange Is the New Black,” surprising a show superfan Christopher (or in Morello’s voice, “Christopha”) who is expecting the delivery of a new LG OLED TV. The two-minute video, directed by legendary prank director Jeff Tremaine, depicts Morello coaxing Christopher to run her a bath while she and a crew set up the new TV. They take to watching “OITNB” for a few minute before Morello is taken back to prison. The social campaign will continue through the end of the year, with different Netflix characters and surprises, Fernandez says. The company chose to partner with Netflix due to the “loyal community” of fans for the provider’s many shows, she says. Using social media as the platform was a way to connect with the “water cooler” zeitgeist of popular programming, she says.